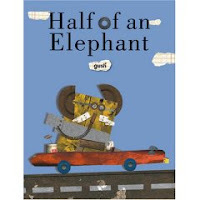 Half of an Elephant by Gusti. Copy supplied by publisher, Kane/Miller. Originally published in Mexico 2006. An elephant is fast asleep when CRACK the world is split in two. He wakes up half an elephant and now has to search for his other half. The plot is a mix of silly and serious as elephant (and every other animal) has to go looking for it's other half. In a weird way, this is like an adult romance break up and get back together story: elephant has to learn to be strong on it's own! Elephant is so desperate to be whole that it hooks up with the wrong half of an animal! And at the end, when the two halves reunite because after all, they belong together, each half retains its independence. It applies to any situation where someone "cannot live without the other person" yet find out... yes, the can. The illustrations are very inventive; as described on the book flap, they are "digital images of numerous discarded objects to show children that art can be created from objects that usually end up in the garbage can." As such, I can easily see this being used to inspire art projects. Aside from the story itself, it's fun to look at the various animals and figure out what they are made of. For some reason; I think because of the combination of "found objects" and the way the half animals survive despite being cut in two; I also read this as magical realism in picture book format. OK, so magical realism isn't quite the term I mean... but I cannot think of a term to use where the text of the story is so serious and factual while discussing something that is impossible. The serious treatment of something magical; the treating it as every day and normal; appealed to me, especially since the illustrations are also other-worldly. And He's Protesting What, Exactly? Look Out for the Anvil! Huh. It's True : Updated with Rant! What Are You Doing Saturday June 23rd? If We Were Watching, Why Was It Cancelled? New York Times: Are Book Reviewers Out of Print?